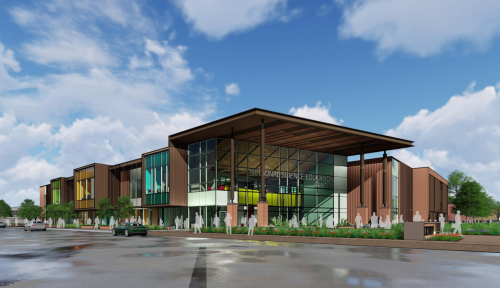 Through construction projects and initiatives, Northern State University's campus evolves to meet the needs of students, employees, the community and the region. Follow our progress! Click here for a list of frequently asked questions and answers. NSU hosted community forums on Dec. 19, 2017, Jan. 11, 2018 and Aug. 23, 2018. Thank you all who attended and provided feedback. 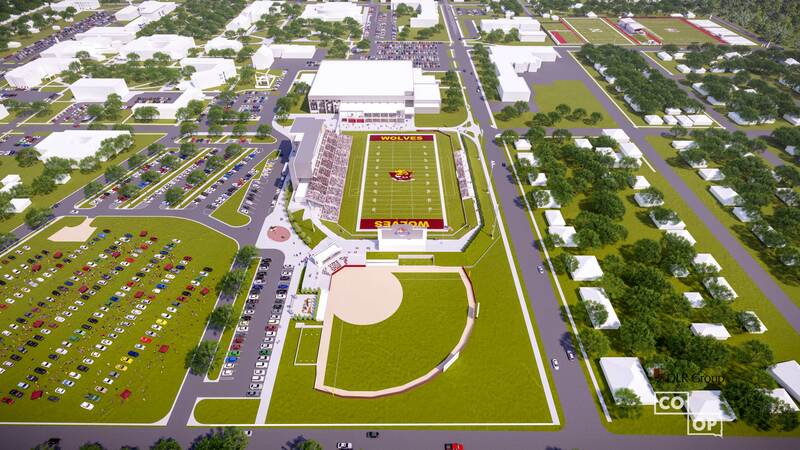 This campaign seeks to raise $55 million total for three connected projects: construction of a new School for the Blind and Visually Impaired; NSU’s athletic and recreation fields project; and an on-campus regional sports complex. Learn more at educational-impact.com. 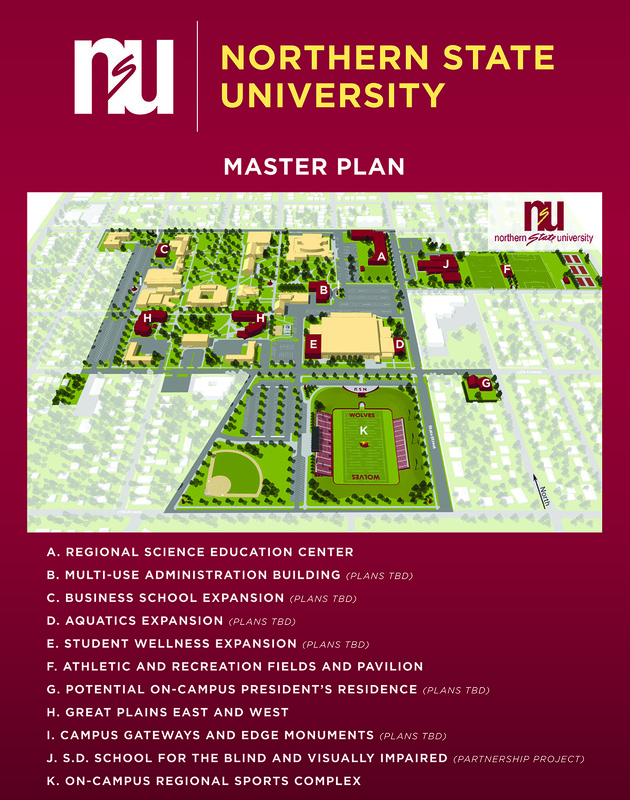 NSU's campus master plan lays out numerous other potential projects for the next decade and beyond. Projects shown above are preliminary concepts and may change. When students begin classes in fall 2019, they will be the first of many to study in the new Northern State University Regional Science Education Center, which will advance educational and research opportunities for the university and the entire region. Center construction began in spring 2018 at the corner of South State Street and Twelfth Avenue Southeast, which serves as a gateway to campus. The site, on the west side of South State Street between the former Jerde Hall and Johnson Fine Arts Center, previously was the football practice field. 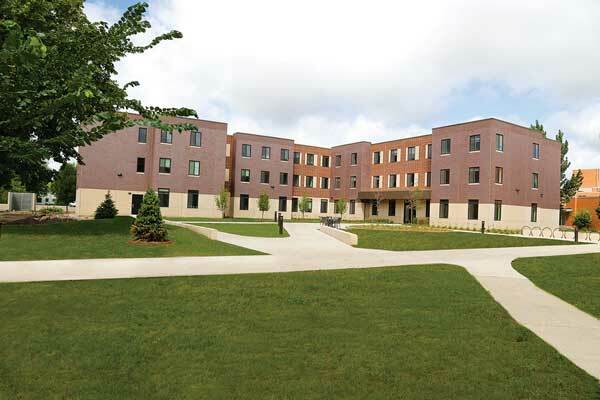 Two residence halls – one located south of the Mewaldt-Jensen Building and the other at the site of the former Lindberg Hall – are complete. One hall provides a pod-style design, with eight to 10 traditional double rooms situated around a common living space and community bathroom. The other hall is designed with a series of semi-suites and suites offering both double and single rooms. Jerde Hall - on the east side of South State Street - has been razed, and a new School for the Blind and Visually Impaired is under construction there. A new football practice field and women's soccer field are being built east of the former Jerde Hall. Combined with a 6,000-square-foot storage and restroom building, the estimated cost is $6 million. Six tennis courts will remain on the east edge of campus. 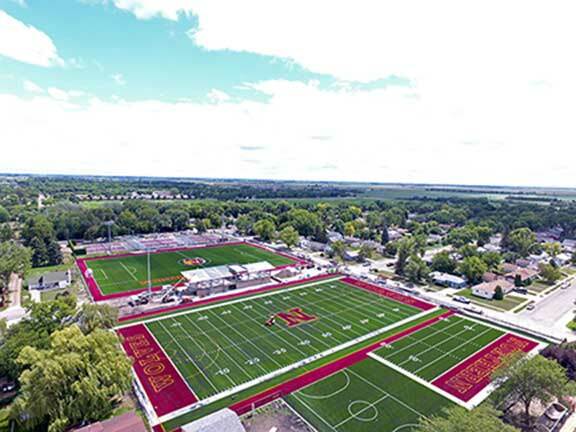 Northern State University is working on plans to build an on-campus football stadium and softball complex on the site of the South Dakota School for the Blind and Visually Impaired (SDSVBI). 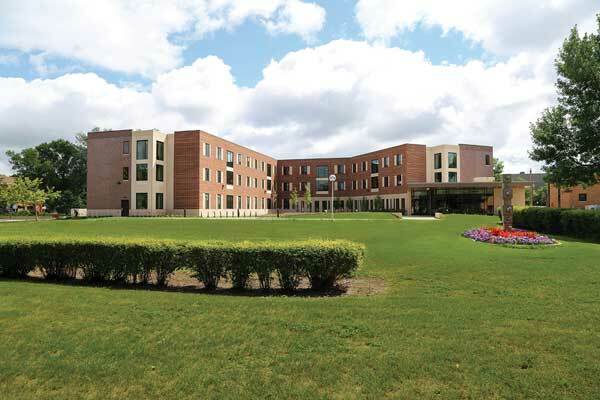 A new SDSBVI will be built where NSU's Jerde Hall stood. 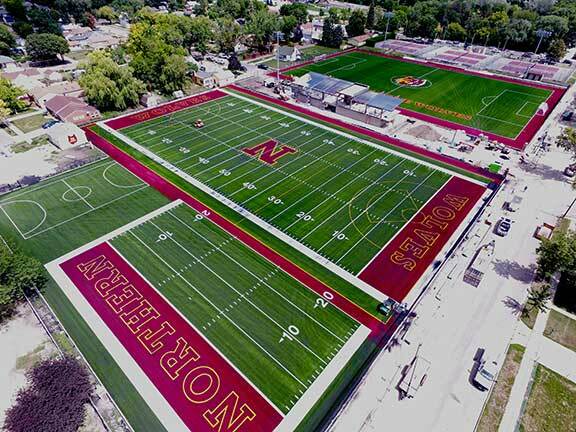 The former SDSBVI site would host a new football stadium (estimated 4,000 - 8,000 seating capacity) on the south side of Northern's campus. 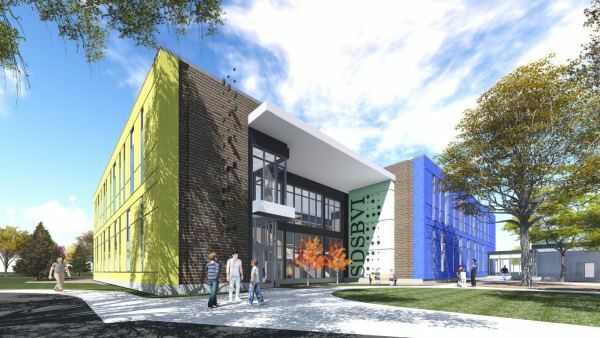 Northern State University and the South Dakota School for the Blind and Visually Impaired (SDSBVI) are planning a joint project that will include a new $14 million home for SDSBVI. The proposed site of the new School for the Blind and Visually Impaired is the former site of Jerde Hall, which was recently demolished. The current SDSBVI site is the area being explored for a regional sports complex. NSU faculty and staff will continue working jointly with SDSBVI faculty and staff on the development of revised and new special education programs offered by NSU’s Millicent Atkins School of Education. 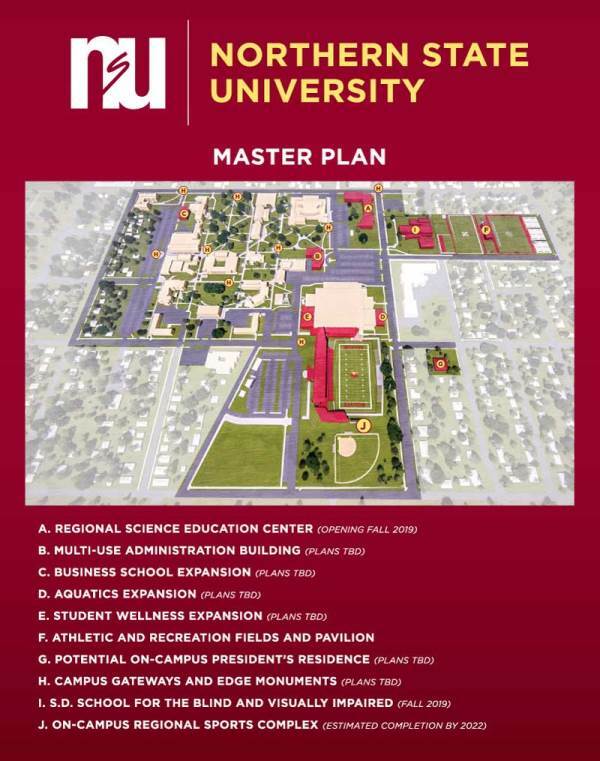 Please use the NSU Master Plan Feedback Form to submit comments and questions about NSU's master plan.